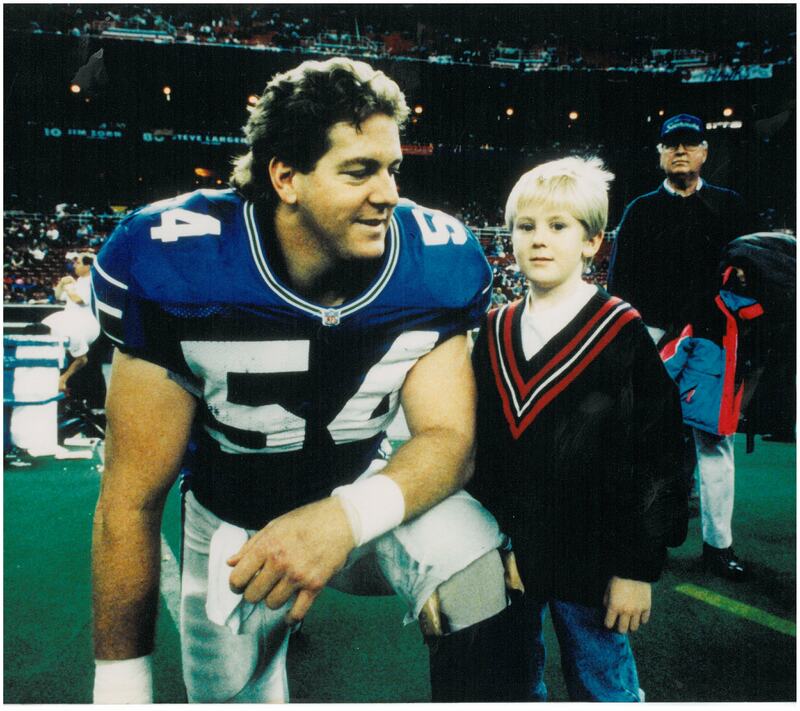 Grant Feasel was a father, a brother, an 11-year NFL veteran and, now, a Legacy Donor. But who was Grant, really? His closest family members and friends offer their thoughts and memories below. Grant Earl Feasel passed away peacefully in Fort Worth, Texas, on Sunday, July 15, 2012 after a lengthy illness. Grant, a long-time resident of Colleyville, Texas, is survived by three children: sons, Sean and Spencer, and daughter, Sarah; mother, Patricia Feasel; sister, Linda (Feasel) Slayton; brother, Greg Feasel; children’s mother, Cyndy Feasel; plus numerous nieces, nephews and extended family. He was preceded in death by his father, DeWayne Feasel. Born on June 28, 1960 in Barstow, California, Grant graduated from Barstow High School in 1978, lettering in football, wrestling and baseball. Upon graduation he was awarded a football scholarship to attend Abilene Christian University. At ACU Grant was a four-year letterman and a three-year starter from 1979 to 1982. As a senior, he was named an Associated Press First-Team Division II All-American, First-Team All-Lone Star Conference and was voted the conference’s lineman of the year. 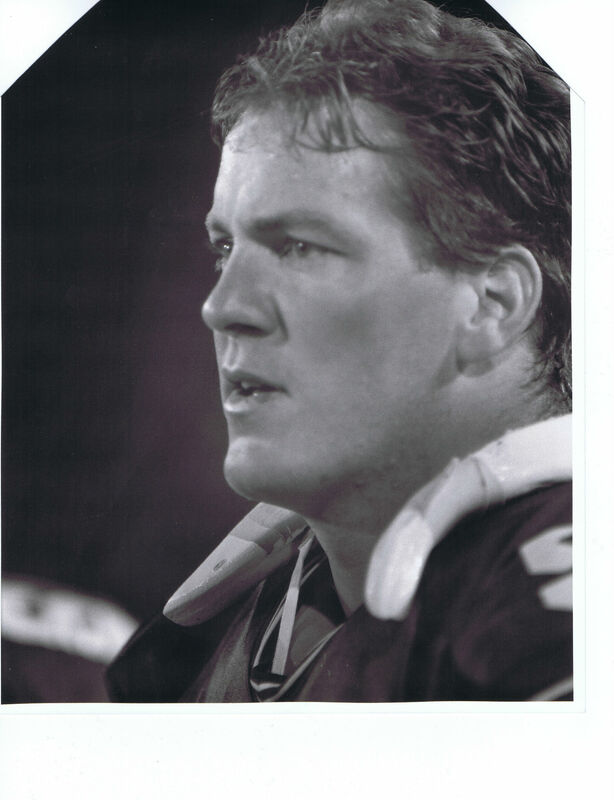 A three-time academic all-conference choice and second team Academic All-American as a senior, he was selected to the ACU Sports Hall of Fame (Class of 1994-95) and LSC Team of the Decade for the 1980s. In 1997 he was selected to the NCAA Division II Team of the Quarter Century. He majored in pre-medicine and was accepted to Baylor University’s College of Medicine. He also was awarded the prestigious NCAA Post-Graduate Scholarship and the Annual Trustees Student Award for outstanding contribution and devotion to Abilene Christian University in 1983. Drafted by the Baltimore Colts in the sixth round of the 1983 NFL draft, Grant played eleven seasons in the National Football League. He played for the Minnesota Vikings (1984-86) and the Seattle Seahawks (1987-93). 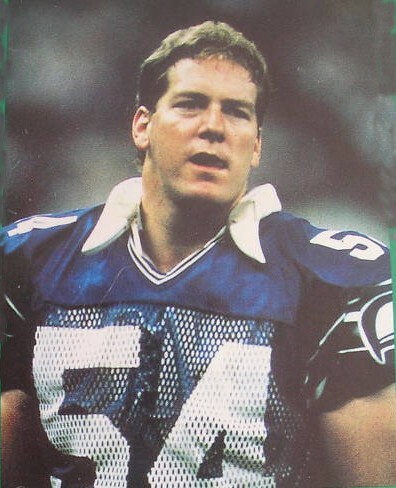 He started for Seattle in the 1987 NFL playoffs, and also competed in the 1988 playoffs and played every offensive down of the sixteen-game season in 1989. Grant and his family were long-time members of the Richland Hills Church of Christ. He was a beloved father, son and brother, plus a friend to many, many people. The following tributes were written from his loving family and friends and shared during Grant’s memorial service. It seems like yesterday I was in elementary school having to tell the class what I wanted to be when I grew up. While the other kids said they wanted to be firemen and doctors, I remember standing up with confidence and saying, “When I grow up I want to be my dad.” Grant Earl Feasel was my hero, although he didn’t wear a cape and fight off villains. What he did do was teach not only me, but my brother Sean and my sister Sarah everything we know. I know there are hard times, and we all had some differences, but at the end of the day I wouldn’t have wanted to grow up any other way. I know I lost my dad when he was only fifty-two years of age and I was only eighteen, but I know this has happened to make me the man and father I will someday be. I just hope that I can be half as great a father to my children as mine was to me for only a short eighteen years. And I will cherish those eighteen years with my father and look back on them for the rest of my life. 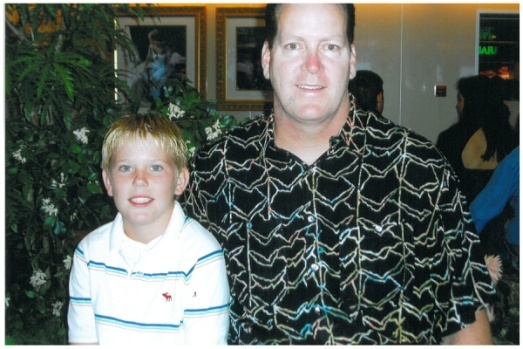 My dad was the greatest father I could ever ask for. I love you so much, Dad. I’m sorry we had to say goodbye, but we will meet again one day in Heaven. As I sat down to write this, I found it so very difficult to come up with the right words to adequately describe my father and everything that he means to me. How could I possibly articulate my feelings for such a special person and the relationship that I had with him? How could I possibly translate my emotions into words that would allow me to paint a picture of what I feel inside my heart? My dad was so many things to so many people. The first word that comes to mind when I think about my dad is “Hero”—I promise that Spencer and I did not compare notes as we were writing. I didn’t know that he said the same thing until I read his letter late last night. But I was not surprised, because my dad was a real-life hero, in every sense of the word, to me, Spencer, and many others. I cannot tell you how many people have reached out to me over the past few days just to let me know that my dad was their hero, because I lost count. I have so many fond memories of my dad. I didn’t even know where to start when it came time for narrowing down what to share with you. My dad was my best buddy in the whole world when I was growing up. 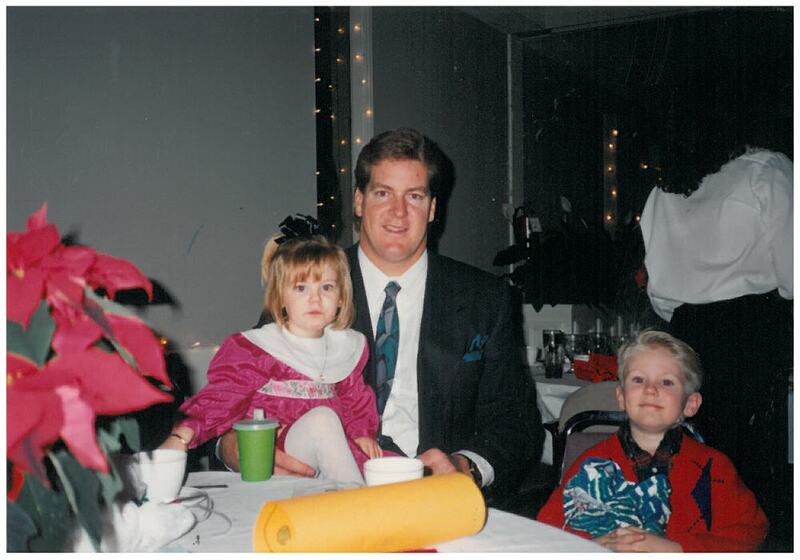 I looked forward to the football offseason each year like most children anxiously await Christmas morning, because offseason meant that I had my dad all to myself for a few months. And we made sure to take full advantage of the time together. I hope this doesn’t upset any of his former teammates who are here today, but I sure wasn’t upset when they failed to make the playoffs! We did all kinds of cool stuff during the offseason—it seemed like he had something planned almost every day. We would play golf, go to the pool, build stuff in the garage. We made all kinds of memories that I will cherish forever, but our favorite activity back then was to ride dirt bikes together. I remember one time we loaded up our bikes and went to check out a new track that we had never been to before. We started off cruising around, and we explored some trails for a little while. But I quickly grew tired of that and challenged him to a race. We picked out a tree way off in the distance as the finish line. I could tell he was pretty confident that he was going to beat me because he had a much bigger and faster motorcycle, but he didn’t know that I had a plan. The route to the finish line was a big half circle around a field covered with waist-high brush. I was going to let him get ahead of me and then cut through the brush field straight to the finish line. My plan was working perfectly, right up until the point that I ran into an old, dried-up creek bed that was about eight feet deep and four feet wide, going way too fast to stop. It was an ugly crash that ended with my bike on top of me in the bottom of that creek bed. A few seconds later my dad pulled up and took his helmet off, and once he saw that I was okay, he started laughing so hard that he couldn’t even talk. I was curious as to what he thought was so funny because I sure didn’t see the humor in my current situation! He helped me to my feet, and once he gathered himself he said, “I was watching you tear across that field at top speed and all of a sudden you just vanished into thin air! I thought you disappeared into the Bermuda Triangle!” When I heard that, I started cracking up. Once we finally stopped laughing, he pulled me and my bike up out of that creek bed and said, “Well, Sean, I bet that will teach you not to cut any corners in life.” And you better believe I remembered that lesson after I learned it the hard way. As a small child I guess I just assumed that all fathers were as great as mine, but it became very clear that my dad was the coolest one day in the First Grade. That day was career day. 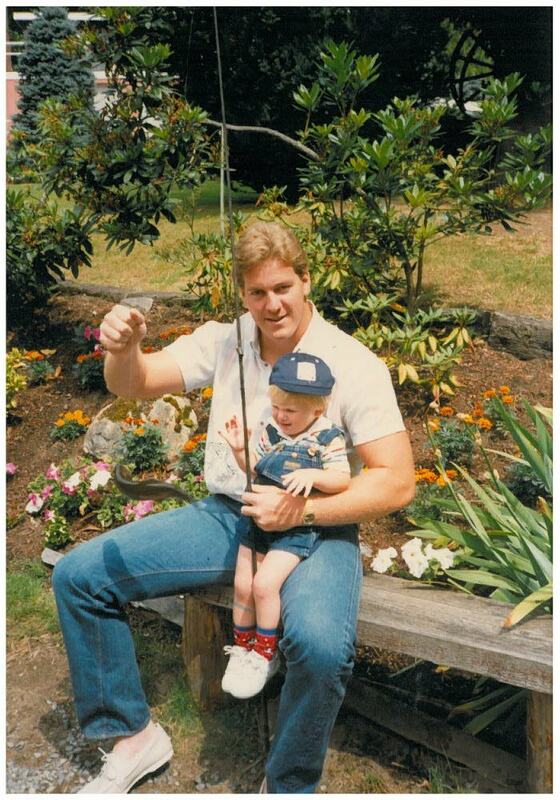 Evidently all of the other dads did not play football for a living, and being a pro-football player was the coolest job ever—that was news to me! If I remember correctly, we had a policeman, a lawyer, a preacher, and a doctor show up as well. All very noble professions, but the football player stole the show that day! Needless to say, I never had anyone approach me with the “my dad could beat up your dad” argument. Though my dad was so much more than just a football player, there is no denying that the game was a big part of his life. You are all aware of what he accomplished as a player, but I want you all to know that his accomplishments on the football field extended far beyond the end of his playing days. He most certainly passed his competitive drive and his love for the game down to me. And he used the game of football as a vessel to break through and teach me and many other young men that he had the opportunity to coach throughout the years the important lessons about the game of life. The life lessons that he taught me on the football field molded me into the man that I am today, and I am confident that many others in this room would tell you the exact same thing. He used the game to help build our character, to teach us toughness, sacrifice, resilience, dedication, teamwork, and diligence, just to name a few. I recall a conversation that we had very early on in my playing days just like it was yesterday. He said, “Sean, the most important lesson that you’ll learn out here is how to get back up after you have been knocked down, again and again.” Although I did not grasp the depth of that statement at the time he said it, I really took it to heart, and it has been applicable to my life many times over the years. But, Dad, this knockdown is unlike any other that I have experienced. I know it isn’t going to be easy, but I promise you that I am going to get back up, because that is what you taught me to do. Quite a few of my old teammates have contacted me over the past few days to let me know how much it meant to them that my dad sacrificed his time for all of those years to be a volunteer coach, and what an impact that time had on their lives. It brought back so many good memories. Some of the stories that came up earlier this week brought me to laughter and put a smile on my face at a time when I wasn’t sure if I would ever smile again. My dad gave us pointers, encouragement, constructive criticism—though there were a few instances when I questioned the constructive part—and taught us many tricks of the trade that only an old NFL vet would know. He gave us a clear advantage over the competition on the gridiron. But more importantly he always made sure to relate what he was teaching us on the football field to what we were going to encounter in the real world, and he made sure that we knew how to apply the same principles to face the challenges and climb the obstacles of life. Not only did my dad use coaching as an outreach ministry, he also used the platform built by what he accomplished on the football field to make a difference by reaching into the lives of many others and touching their hearts—hearts that he may not have had an opportunity to reach otherwise. Looking back, it was such a privilege to be able to tag along with him, and have a front row seat on many occasions to watch as God used my dad to inspire others. I remember going with him one time when he went to speak at a men’s retreat back when I was just a little guy. It was truly a testament to the character of my father to see firsthand just how influential of a man that he really was, and to watch him use his ability to influence to spread the message about his Lord and Savior. My dad knew that his status as a football player gave him the gift of influence, and this was not a responsibility that he took lightly. And I am so very proud to tell you that he used that gift to further the kingdom of God every single time that he had an opportunity. 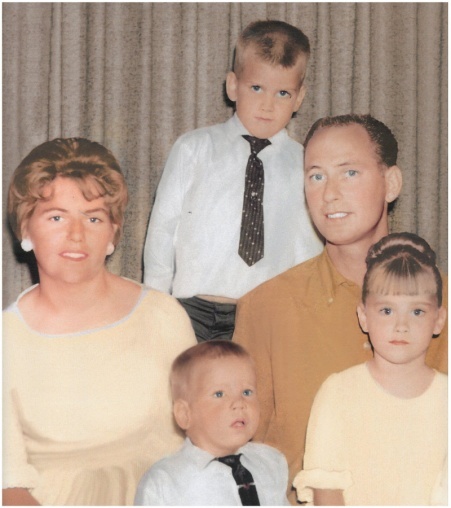 I have had several people tell me that they would not be a part of the body of Christ today if it were not for my dad, and I guarantee you that he was far more proud of that than any of the rewards he ever received for playing football. Wow, where do I start today? I apologize up front. There is no playbook for this. First, our family is grateful, honored, humbled, and blown away by the love and support. Secondly, it’s great to see everyone. We want to thank you for coming today to honor Grant and by honoring him our family and you honor God. We want you to know how important all of you are to us. Our lives have truly been blessed because of you. I’m so sorry for all of us. It needs to be said upfront, the last few years have been very difficult for Grant and very difficult for our family. We are so sorry. We also need to send out a special thank you, to the ones who went above on beyond the call of duty for Grant. You stepped up for him—we know there was many times when it was very difficult. I will not even try to say the names or list what you did for him. It was family, friends, co-workers, the people Valley Hope, Spring Wood, Heartland, HEB, the Hospice and his work (Fuji Film). You know who you are, we know who you are, Grant knows who you are and more importantly God knows who you are. You are remarkable people. You set the bar for the Golden Rule. You did it out of respect and love. From the bottom of our hearts we thank you for loving Grant. We want you to know we are as shocked as you are that this could happen to Grant. We are asking the same questions. How? Why? What happened? How does a guy from 1291 West Buena Vista, in Barstow, overcome every obstacle thrown in his path, not beat this one? The answer is we don’t know and may never know. But, that not why we are here today. We are here to remember Grant, celebrate his life, and celebrate God’s gift of grace (getting what we don’t deserve) and gift of eternal life. Grant chose Christ (you can book it), and as Christian’s we don’t pass from life to death. We pass from life to life. None of us, including Grant were happy about his condition at the end. Today we can have heavy hearts, we can cry, we can get angry, we can be confused. But, we can also have joy. We can have hope and peace because we will see him again in Heaven. As Christians we know God’s love is unconditional and God’s grace unconditional. That’s His promise! We also know God has a special place for Grant because he did make that decision. We also know Christ died on that cross for all of us. Grant stumbled. He knew it. He said it with his lips. He said it with his eyes. It’s said, “The eyes are the windows to the soul”—and you could see it in his eyes. He knew it. Job said, “For the thing which I greatly feared has come upon me.” Grant gave up a sack. His gifts were not enough to overcome this adversity. Grant and I were big Rocky Balboa fans growing up. I remember the two of us driving the Red Sled (1952 GMC pickup) to San Bernardino to see the first Rocky movie in (1976). In Rocky IV it’s Rocky vs. Drago, David vs. Goliath. Drago was billed as unbeatable, invincible, the perfect athlete, the perfect fighter. Old school vs. new school, low tech workouts vs. high tech workouts. As always, Rocky had no chance to win. The fight starts; he gets knocked around. Then, out of nowhere Rocky cuts Drago. Rocky’s manager yells, “You see, you see—he’s not a machine. He’s just a man.” At times, we all saw Grant as bigger than life and maybe invincible. Well, Grant was just a man! On any given play, any moment in sports, it’s filled with imperfections. We all are just human. We are not perfect. But by the grace of God and the sacrifice of His Son, Jesus, we can leave our imperfections at the foot of the cross. Everyone knows our family loves the beach. You have to love the ocean after growing up in Barstow where the summer temps are always over 115 degrees. We have all watched little kids play in the surf, running back as forth as the waves come in and go out. I will never forget the first time our daughter, Zoie, got blasted by a wave (yes, on my watch). She would have a smile on her face from ear to ear as the waves chased her to shore. She would turn around and chase the water back out. Each time she would gain more confidence and go farther out. We all know what happened next—the big one hit! Arms, legs, hair everywhere as she tumbled back to shore—tears, nose running, covered in sand. Zoie did not plan for that to happen. She did not see it coming, but it did. I think that, in some strange way, is what happened to Grant. He did not see it coming and got too far out and could not get back to shore. Praise God for His grace, and for His promise—that death does not determine the direction we go, He does. We all knew Grant was special at a very early age. He was always ready for the game, ready for the test, ready for any task both mentally and physically. I remember he started running a bank out of a red metal ammo box. He might have been 8 years old. And, yes, he had the only key— who knew?! Mom often went to him for milk money. He was always happy to help out. But, he always made sure Mom paid him back. And, Linda, I think we can assume Grant finally has forgiven you for not paying back that $1 you took from the bank and never paid back. At 10 it was clear that he knew how to lead, and we saw it in pee wee football (the Marauder’s). At 12 we saw his compassion and his love for others and his love for God. As a camper at TANDA Church Camp he was named the Best Boy Camper 1974. He always knew what he wanted and was gladly willing to pay the price, or he was willing to walk away. That conviction, that mind-set, continued into college. He told the football coaches he would come to ACU but wanted to be a pre-med student and he would not miss the afternoon labs or his studies. On most nights he was gone from dorm room well past curfew. Everyone knew he was in the science building, studying. Wednesday morning at the gym as I turned on my iPad/Netflix, I searched for a movie to veg out. Brian’s Song popped up. For you under forty, it’s a true story—a beautiful story about two Chicago Bears running backs, their lives, their unique/special relationship and death in 1971. I quickly flashed back to Morris Dorm at ACU—I can picture that dorm room full of football players like it was yesterday. I was telling Hal Wasson this story. He said I had the wrong room. I’m right. Hal is wrong. Then we argued which floor it was. Picture this, the lights turned off. Each of us holding a pillow to hide the fact that we were crying. Anyway, the scene that sticks out is at the end of the movie. Brian Piccolo and Gale Sayers are running through the park. The voice-over is the coach, George Halas. “Brian died of cancer at the age of 26. He left a great many loving friends and family who miss him and think of him often. But when they think of him, it’s not how died that they remember. But rather how he lived, how he did live! Today, let’s remember how Grant lived. “The first time I saw Grant, I thought he looked like a basketball player but found out soon enough how quick and aggressive he was in practice and explosive he was in games. I remember he always had time to listen to me no matter what the circumstances and encourage me when things were tough. He taught me how to surf when we were playing the University of Hawaii. But the most important experience that has lasted a lifetime for me was and is his example of being a Christian. I am thankful to Grant and his family for taking an interest in me as a young, lost individual and giving me some direction through Christ Jesus. After becoming a Christian, Grant was one of the first people to congratulate me and encourage me. “And if was lucky I might get a bite of his mother’s famous cinnamon rolls. “He sent me a care package during Desert Shield/Desert Storm which had the Seattle Seahawks return address on the box. It was fun watching the reaction of some of my fellow Marines as I opened the package. He was always a positive influence on my life. I love you Grant—you will always be in my heart. “Today I’m thinking of when we were boys in Barstow. Grant, you had a sense of humor, perfect timing—you were funny. Thanks for all the laughs. So on this day of death and sorrow, I choose to think upon life and laughter. Through faith I know Grant is alive and well, happy in his new body, finding humor in it all. “When I first met Grant on my recruiting visit to ACU, all I knew was, ‘This guy is big!’ But it didn’t take long to get to know Grant and find there was so much more to him than size and athletic ability. “Grant was a leader. He was a great football player—and going against him in practice every day made me a better player too. He led by example—not a lot of talk, but hard work and commitment. He pushed himself to be the best, and others followed his example. “Grant was smart. I was always impressed that he was Pre-Med and played football. Not only was it difficult, but he excelled—I remember his GPA being in the 3.5-3.6 range—leaving practice early or coming late because of a chemistry or bio lab. “Grant had a great sense of humor. He loved to laugh. He was always cracking jokes and making fun of himself and his teammates. “Grant had a great heart. If there was one thing I knew about Grant, it was that he cared for people. It was obvious in the way he interacted with others—he could be funny, have a great time joking around, but then serious about the important things. “As I reflect upon my time with Grant, I am reminded of the Biblical characters David and Goliath. When an offense breaks the huddle, the first to leave and the first person the opposing team sees is the center. Just as the Israelites first saw Goliath, the defense would first see Grant approaching the line of scrimmage. A towering and impressive site that we hoped would reflect the upcoming offensive attack. He gave confidence to his teammates because of his size and ability. Yet, like King David who led his soldiers in battle, Grant’s teammates knew he would perform his assignment correctly. They knew he would make the correct calls at the line. With his shepherd-like spirit he would encourage and challenge his teammates in the huddle, on the sideline, and in practice. His teammates also knew Grant gave God the glory for his talents and ability. “Grant would laugh with other people but never at their expense. “Shamelessly used his large size to get to ride shotgun wherever we were traveling, and if he ever did end up in the back seat, would repeatedly complain to the point he would wear us out, and we would put him in the front seat just to shut him up. “He would sweat more profusely than anyone we’ve ever known. “He was moral and decent.